I LOVE to check gauge in crochet. Said NO ONE. EVER. I am pretty sure I’ve spent most of my entire crochet life avoiding a gauge swatch like the plague.I really hate every thing about it–the idea that you must take time out before diving into your project to crochet something you will never use so that you can decide whether or not the hook you especially bought for the project will even work for you. I hate it. So I’m here to tell you what you need to know about gauge, when you really do need to do a gauge swatch and, more importantly, when you don’t. Here’s the bottom line: If it is something that needs to fit you or someone else or is otherwise a project where it is important that your finished piece turn out to be the exact dimensions in the pattern, then you need to put on your big girl pants and figure out your gauge. Here’s how. 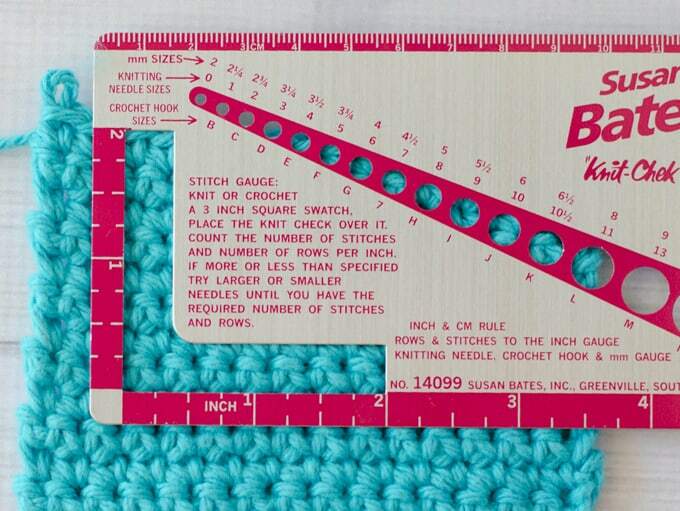 Buy a handy knit-check ruler. It makes it easy to check gauge in crochet. This one is easy to find in the United States, but others are available too. 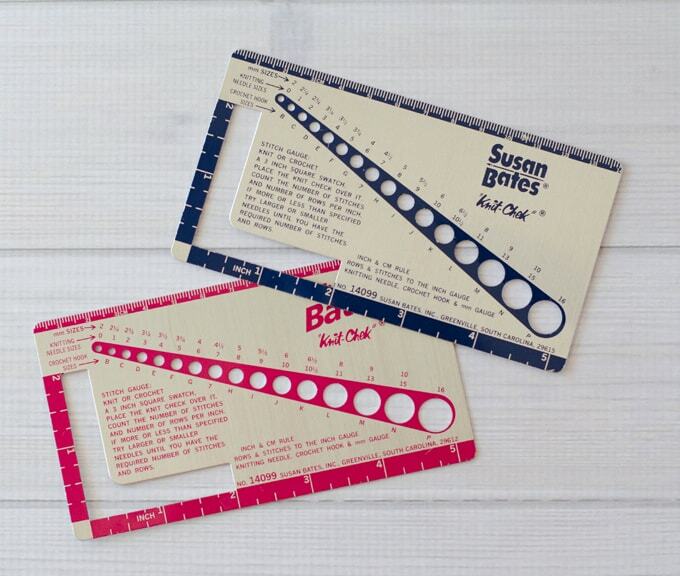 Yes, you can use a regular ruler, but this one is so much easier to use and if you’re going to do a gauge swatch you might as well make it as easy as possible on yourself. Plus if you are a knitter (or want to learn) you’re going to find those holes handy for determining the size of the knitting needles you misplace around your house. Technically you can use it for your crochet hooks too if you have a hook without the size imprinted on it. Crochet a sample in the stitch specified in the pattern about 3-4 inches across and up and down. Find a spot away from an edge and place the cut out section of the ruler a row of crochet and count the stitches that fit across it. The example has 7 stitches for a 2″ space. The pattern might also specify the number of rows in the gauge. I never bother counting this; if you get the gauge right in the stitches across, that is usually sufficient. A crochet stitch is in proportion to itself, so focus on getting the number of stitches across the work correct and the stitch height should take care of itself. Next, look at the pattern gauge information and compare with your gauge swatch. The gauge in the pattern might specify a different measurement–such as 1 inch. 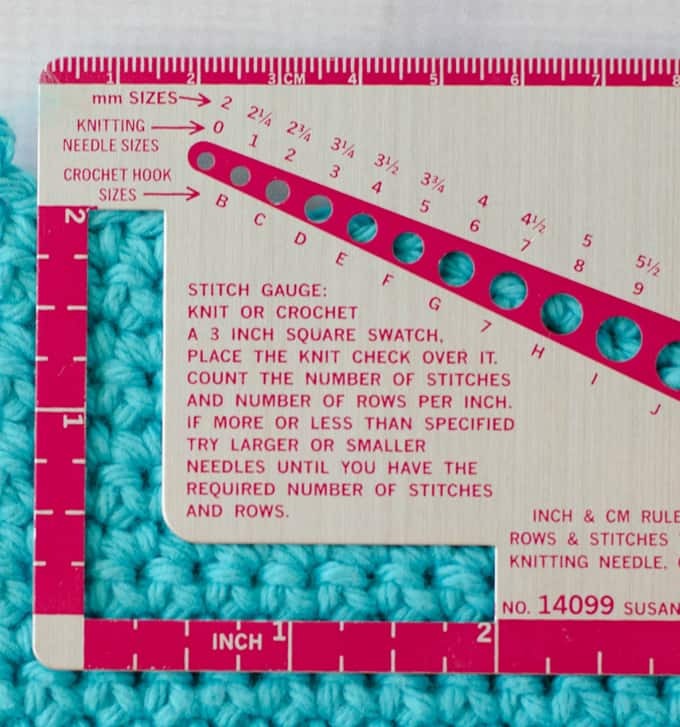 So you may have to do some math to get the stitches per 2 inches you counted converted to the “per inch” measurement in the pattern. For instance, if the pattern says “gauge: 4 sc per inch”, then you would divide what you got,7 stitches per 2 inches, by 2 to come up with 3.5 single crochet per inch. Do not make the mistake of thinking “it’s close enough”. Small differences add up in the pattern. The last thing you want is to spend a lot of time and money making something and then finding out it is too tight or too big because you were lazy with your gauge. It is always a good idea to measure a few areas on the gauge swatch to check gauge in crochet and confirm the correct count. Now..for the best part… when can you NOT make a gauge swatch? Well…any time you don’t really care if your end project is the exact same size as the designer’s project. I never measure gauge for amigurumi or stuffed toys, dishcloths, anything decorative. I rarely measure gauge for an afghan. I don’t care if those things are the exact size of the pattern. Just keep in mind, you may have to buy an extra skein of yarn on larger projects just in case your gauge has you using a bit more yarn than the designer. Love it or hate it, sometimes you just need to know how to check gauge in crochet. And now you know! Thank have never seen one of these before! Thanks for sharing! I am currently running the Beginners Crochet Group on Facebook and this little would be handy to share with the group. Thank you!